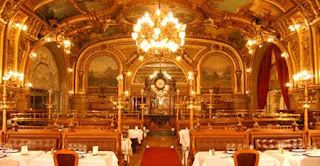 My favorite "WOW" dining place in Paris is Le Train Bleu. Fabulous dining at a train station? Gare de Lyon train station, to be exact. It was so stunning and yet so comfortable. You know those places where you pay gobs of money to feel uncomfortable? Forget about them and visit Le Train Bleu instead. The menu is excellent, as is the service.